or not you will be able to see them, but at least we tried. We will probably never do this again! Why an entire web page about the word “kamado”? You ask this of the webmaster who devoted a whole web page to the word “spatchcock”? Well, there are all sorts of statements that float around the ceramic charcoal cooker universe that “kamado” is not a real Japanese word. That it was invented in 1960, a shortened version of “mushikamado.” (We`ll get to that word later...) There are cookers named “Kamado”, Primo Kamado”, “Komodo Kamado” and “Imperial Kamado”. 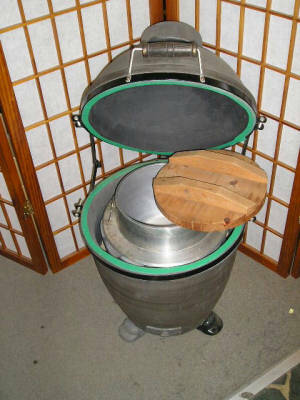 People refer to their ceramic charcoal cookers as “kamado-style” cookers. Yet some claim that “kamado” is a registered trademark. So we thought we`d do some nosing around the Internet to see what we could learn. A mushikamado with the lid open showing the rice cooking innards. A mushikamado with the lid closed. My it looks familiar! We won`t try to delve any deeper into the origin of today`s ceramic charcoal cookers since this webpage is really about the word “Kamado”, but we thought with all the talk about mushikamados, that you would like to actually see one! So, back to the word “Kamado”. First of all, is it a registered trademark? While some say it is a registered trademark, the word itself is used generically by other manufacturers to indicate a type of cooker derived from the Japanese mushikamado. Is it proper to label these other ceramic cookers as “kamado” style cookers? A search at the United States Patent and Trademark Office reveals no such trademark has ever been registered. (Their database contains both live and dead or expired trademarks, going back well before 1960. Searching on “Kamado” reveals that“Imperial Kamado” (owned by Imperial Kamado), “Grand Kamado” (owned by Jackson Pottery, Ltd. of Dallas, Texas) and “O Kamado Meshi Torafuku” (owned by a Japanese company) have been registered, but not “Kamado”. The trademark needs to be tagged with the letters “TM” in superscript. The trademark must be used in commerce continuously. Trademark owners are responsible for policing their marks and must make sure that any offending usage is stopped. It appears that none of these things have been done, so if “Kamado” was ever claimed as a trademark, any rights to it as a trademark would appear to no longer exist. So, it should not problematic to be calling modern ceramic charcoal cookers “kamado-style” cookers. (Although we would have to agree that technically, “mushikamado-style” would be more accurate.) For those interested in more information about trademark law, we found this website to be helpful. But what about the word “kamado” itself? Is the word a real Japanese word? 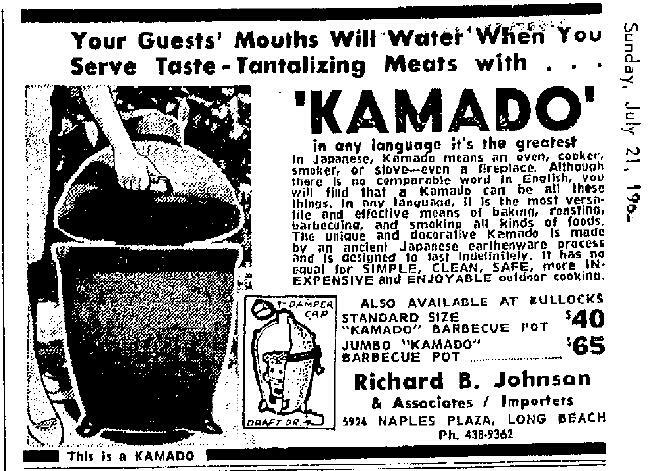 Richard Johnson, owner of the Kamado company says in numerous locations on his website that “kamado” had no meaning in Japan before 1960, that in fact he invented the word “Kamado”. A cooking range. It was constructed primarily of earth or clay - although stone, tile, and brick were also used from the mid-19th century. Fuel was inserted through stokeholes in the side, and a fire was made in the hollow interior. Pans and cauldrons of bronze, iron or pottery were set into the circular hole or holes for cooking. The cauldron or pan had a projecting flange or rim which rested on the edge of the cooking hole to allow its lower part to project into the fire below. Along with the open hearth, the kamado was one of the two basic forms of domestic cooking appliance in use in pre-modern Japan and it was also adapted for certain proto-industrial processes, such as salt manufacture. 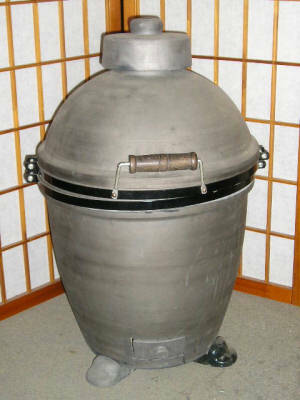 Kamado were used throughout Japan although design varied according to location and period. The kamado is believed to have been introduced to Japan during the Kofun-period (300-538), since the earliest known examples were revealed by excavation of Kofun-period pit dwellings. They were made of clay and earth, located close to the periphery of the pit, and a clay chimney was often incorporated to vent smoke, an arrangement reminiscent of early kilns, though on a smaller scale. Such kamado were built-in, but portable kamado of pottery were also in use in the ancient period. The late 12th century "Mount Shigi Legend Picture Scroll" shows a large non-portable single-hole kamado set directly upon the earth in use by the end of the Heian period (794-1185). By contrast, an illustration of a contemporary Buddhist monk's residence in the mid-14th century picture scroll Boki ekotoba (roll 8) shows a 2-hole kamado set upon a freestanding timber framed platform with a plastered base. By the Edo period (1615-1867) in the kitchens of upper class residences and in temple kitchens large kamado with multiple cooking holes were used. They were most often situated in the earthfloored area, sometimes they were freestanding and sometimes adjoining the raised timber floor. In the latter case, the stokehole usually faced toward the doma, and a plastered wall was sometimes built above it, as in the Kuri of Shuuon'an (a Zen temple near Kyoto), to screen the food preparation area from smoke. In vernacular houses, kamado tended to develop during the course of the Edo period (1615-1867) from a low simple design to elaborate multiple-cauldron ranges high enough to tend while standing rather than squatting. Even in the Kinki district, where the design of kamado was most advanced and the open hearth little used, archaeological investigations undertaken in the doma of important cultural properties in Imaichou, Nara, have revealed that the kamado of urban vernacular houses in the 17th century were low, often set in a shallow sump excavated in the doma, and had only one cooking hole. By the late Edo period (1615-1867), larger minka of the Kinki district had large ranges with polished black tops, a base, and a stokehole faced with tile. The most impressive such kamado (known as magatamagata kamado 'comma-jewel shaped cooking range') had a curved or horseshoe plan with as many as eleven cooking holes. In remote areas of Hokuriku or Touhoku, the irori was more important and the kamado relatively undeveloped. In such districts, even in larger houses, kamado remained low and rustic in construction and two cooking holes or more were rare. By the late Edo period (1615-1867), some households had a variety of kamado: kamado for use in a raised floor space rather than the doma; small portable kamado (this was also the commonest type in cramped urban tenements; a large one for preparing fodder for domestic animals; and often a special one for use only on festive occasions and for preparing rice cakes. The symbolic significance of the kamado was in proportion to its functional importance as a cooking appliance and adjunct of the hearth. Its tutelary spirit, kamadogami, was one of the principal household deities, revered as provider of the means to cook and feared as a potential cause of conflagration. Until the second half of the 19th century, “kamado” could also mean kitchen. Further, it was considered the symbol of a house and the term could be used to mean "family" or "household." As a result, today there are phrases in the Japanese language that use the word “kamado,”. “Kamado wo wakeru”, which literally means "divide the stove", means to separate the family. If a family is broke, the phrase “Kamado wo yaburu” (literally "break the stove") can be used. So, while there may be no sense of the word “kamado” in Japanese which means “barbeque”, clearly the word is a Japanese word that has existed for 17 centuries. · Tsukikamado (築竈) - Another word for the stove, constructed with stones, tiles, and clay. · Karakamado (韓竈) - A set of koshiki, kanahe, and kamado that can be carried around. · Magatamagata kamado (勾玉形竈) Literally, 'comma-jewel shaped cooking range', large ranges with polished black tops, a base, and a stokehole faced with tile. The most impressive Kamado, it had a curved or horseshoe plan with as many as eleven cooking holes. · Kamadogami (竈神) – The tutelary deity of the hearth or cooking range, revered as provider of the means to cook and feared as a potential cause of conflagration. A mask of his features made of wood or occasionally of clay, was often affixed to a beam or to the freestanding post closest to the kamado at the rear of the earthfloored area in farmhouses in Miyagi prefecture. · Ishikamado - steel rice cookers inserted into a stone frame. · Niwakamado (庭竃) - A new cooking range or open hearth temporarily set up in the earth floored area of vernacular houses from the first to the third of January as part of the New Year festivities. Reed matting was spread around the niwakamado for guests and family members to sit on. The term also refers to the New Year's feast itself. The custom is believed to have been very wide spread, but was particularly prevalent in the vicinity of Nara in the Edo period. · Kamadodono (竃殿) - A building with a hearth or cooking stove. Often a stove may be placed in the ookashigidokoro, the place where rice is cooked. This stove, kamado, is used especially for preparing food to be offered to the gods at shrines. 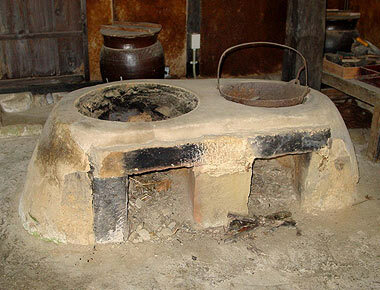 · Kamadono (釜殿) - A simple structure housing cauldrons (*kama 釜) and a cooking range (*kamado 竈). The kamadono or kamaden was found in shrines (a famous example being the kamaden at Kibitsu Jinja), and was used as an area to prepare offerings of food or rice wine for the deities enshrined. Often prefixed with the honorific o 御; okamadono 御釜殿. · Koujinsan-no-kamado (荒神さんの竃) - In some districts, such as Saga prefecture, a large cooking range mainly used for special occasions. Japanese Architecture and Art Net Users System (JAANUS) - www.aisf.or.jp/~jaanus/. Wikipedia, The Free Encyclopedia - www.wikipedia.com/. The Independent Press-Telegram, Long Beach, CA. July 21, 1963 issue.